Barbra Streisand (born April 24, 1942) is an American singer, actress, songwriter, and film director. Her career has spanned six decades and includes achievements on Broadway, in movies, and as a pop recording artist. She is the best-selling female recording artist of all time, and she is one of the few entertainers to win at least one Emmy, Grammy, Oscar, and Tony Award. Notable Quote: "I am simple, complex, generous, selfish, unattractive, beautiful, lazy, and driven." Barbra Streisand was born in the Brooklyn borough of New York City. Her father was a high school teacher, and her mother was a school secretary. Her father died suddenly at age 34 when Streisand was only one year old. The early death caused Streisand's family to plunge into financial stress. Streisand grew up on the edge of poverty. Barbra Streisand attended public school in Brooklyn and developed an interest in acting at an early age. She was also known in her neighborhood for her singing voice—in fact, she made her public singing debut at a PTA meeting. Streisand had an unsuccessful audition with MGM Records at age nine, and she recorded a demo tape when she was thirteen. While attending Erasmus Hall High School in the mid-1950s, Barbra Streisand met Neil Diamond, where they both sang in the freshman chorus. She soon began appearing in small stage parts in the New York area during summers off from school. Streisand graduated from high school in 1959, moved to a small Manhattan apartment, and immediately began pursuing an acting career. While searching for stage roles, Streisand worked as an usher for The Sound of Music on Broadway in early 1960. She auditioned to sing in the show, but the director turned her down. He encouraged her to pursue her singing talent as well as acting. Streisand's first paid singing engagement came in September 1960, when she opened for comedian Phyllis Diller at the Bon Soir nightclub. While performing at the Bon Soir, she developed her talents at banter with the audience between songs. Her sense of humor added depth to the performance. Theater director and playwright Arthur Laurents asked the young and ambitious Streisand to audition for the musical I Can Get It For You Wholesale. She received a small part as the secretary Miss Marmelstein, and the show debuted in March 1962. Despite having a small role, Streisand stopped the show and soon became the talk of Broadway. She earned a Tony Award nomination for Best Supporting Actress. Streisand appeared as a frequent guest on TV talk shows in the early 1960s. She returned to Broadway in 1964 to star in the production Funny Girl. It earned her a Tony Award nomination for Best Leading Actress in a Musical and introduced one of Barbra Streisand's signature songs "People." When Ray Stark signed on as producer of the 1968 film version of Funny Girl, he insisted that Streisand take the lead role, even though she'd never appeared in a film. Critics and audiences lauded her performance. She tied Katharine Hepburn for the Academy Award for Best Actress. Her star rose even higher when she played the lead role in the 1969 film of the Broadway musical Hello, Dolly!. In the 1970s, Streisand expanded her acting range by appearing in a series of comedies, including the 1972 box office smash What's Up Doc?. The 1973 star-crossed love story The Way We Were earned Streisand an Academy Award nomination for Best Actress; she co-starred with Robert Redford, one of the most popular male actors of the early 1970s. From 1969 through 1980, Streisand appeared on the annual list of Top Ten Money-Making Stars ten different times. She was frequently the only woman on the list. The 1976 remake of A Star Is Born co-starring Kris Kristofferson was one of the biggest moneymaking films of Streisand's career. Beginning in 1963, Streisand pursued a career as a pop singer concurrently with her success as an actress. 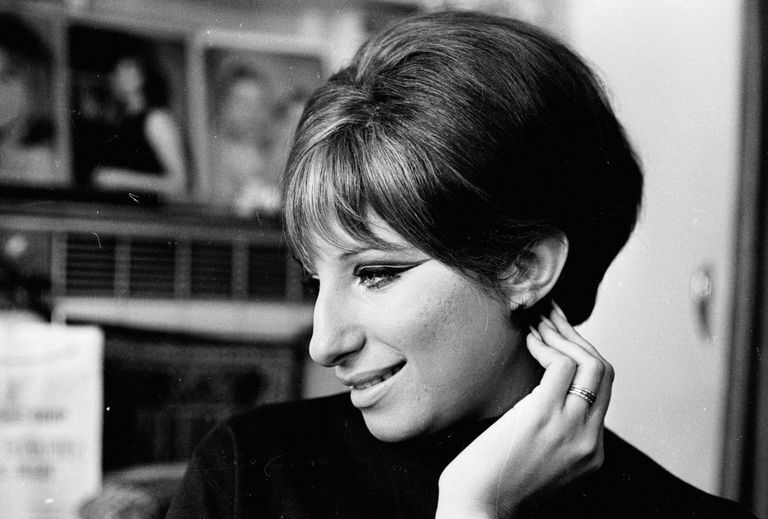 Her first album, The Barbra Streisand Album, appeared in 1963, reached the top 10 list, and won three Grammy Awards. Her 1960s albums often included cover versions of songs from musicals and pop standards. Beginning with the 1971 album Stoney End, Streisand aimed for the pop mainstream. Stoney End reached #1 on the album chart and included the top 10 pop hit title single. In 1973, she went all the way to #1 with her theme song from The Way We Were. It also earned an Academy Award for Best Original Song. Barbra Streisand repeated the feat in 1976 when "Evergreen" from A Star Is Born hit #1 on the pop singles chart and won an Academy Award. Streisand hit #1 on the pop singles chart two more times in the 1970s with the superstar duets "You Don't Bring Me Flowers" with Neil Diamond and "No More Tears (Enough Is Enough)" with Donna Summer. While her commercial success on the pop singles chart faded in the 1980s, Streisand remained one of the most successful album artists. Her 1993 release The Broadway Album went to #1 and kicked off a new era in Streisand's singing career. She has reached the top 10 on the album chart with 14 subsequent releases, and six of those went all the way to #1. In 1983, broke ground with her film Yentl. She became one of the first women ever to produce, direct, and star in a mainstream film. (Every major Hollywood studio turned the project down at least once when they found out that Barbra Streisand wanted to direct as well as star in the movie.) After its successful release, Streisand became the first woman to win a Golden Globe Award for Best Director. Eight years later, Streisand produced, directed, and starred in the film version of Pat Conroy's novel The Prince of Tides. The film earned seven Academy Award nominations, including Best Picture, but Barbra Streisand was again left off the list of nominees for Best Director. Her snub was the subject of controversy and accusations of sexism in the academy. In 2004, Barbra Streisand returned to film for the first time in eight years. She took a well-received supporting role in the comedy Meet the Fockers. Her later projects included Little Fockers, a sequel to Meet the Fockers, and the 2012 road-trip comedy The Guilt Trip. Barbra Streisand has married twice. She met her first husband Elliott Gould when he was the headline star of I Can Get It For You Wholesale. They were married from 1963 through 1971 and had one son, Jason Gould. After well-publicized relationships with Canadian Prime Minister Pierre Trudeau, hairdresser and producer Jon Peters, and tennis star Andre Aggasi, Streisand married actor James Brolin in 1998. Streisand is a vocal and active supporter of the Democratic Party in politics. President Richard Nixon included her on his notorious enemies list. Barbra Streisand broke ground for women in the film industry by taking artistic control of her career and producing, directing and starring in multiple films. She is part of a small group of performers who have won at least one Emmy, Grammy, Oscar, and Tony Award (EGOT). Streisand ranks as the best-selling female recording artist of all time and one of the best-selling recording artists overall. She has sold more than 150 million records worldwide. She is the only recording artist to have a #1 charting album in all of the six decades since the 1960s. Among the many accolades for Barbra Streisand are a Kennedy Center Honors prize and the Presidential Medal of Freedom. Eppridge, Bill. Becoming Barbra. Rizzoli, 2018.